French "yellow vest" protesters, with the Eiffel Tower in the background, rally in support of an older female activist injured in a recent confrontation with police, March 30, 2019, in Trocadero Square, in Paris. "Yellow vest" activists protested across France on Saturday to support an activist injured last week in a confrontation with police and to show that they remain mobilized against the government's economic policies. They're also showing solidarity with Genevieve Legay, a 73-year-old anti-globalization activist who suffered a head injury in Nice last weekend. The Nice prosecutor said a police officer pushed her down. A demonstrator places a mask and a yellow vest on a statue titled "Le Matin," or "The Morning," as French "yellow vest" protesters rally in support of a fellow activist who was injured in a recent confrontation with police, March 30, 2019, in Trocadero Square, Paris. ``We are all Genevieve!'' read an online appeal for Saturday's protests. Thousands of yellow vests marched peacefully in the streets of Paris, from north of the city center through the Left Bank to the Trocadero plaza near the Eiffel Tower. Some waved a rainbow flag that read ``Peace,'' same as the one that Legay was carrying in last week's protest. The French capital was placed under high security, and protests were banned around the grand Champs-Elysees avenue, the scene of past yellow vest riots. 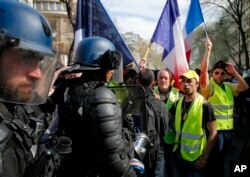 Paris police said 32 people were detained and 21 fined for taking part in an unauthorized protest. In the southern town of Avignon, brief scuffles broke out as police forced protesters out of the narrow streets of the medieval city center. Riot police stand by as French "yellow vest" protesters rally, March 30, 2019, in Paris. The demonstrators are undeterred by protest bans or repeated injuries in 20 weeks of demonstrations. Audrey Bayart, who came from northern France for the Paris protest, said Legay's case shows the government's contempt toward protesters, especially after Macron told a newspaper that the elderly woman should have had the ``wisdom'' not to join the Nice protest. The French government is expected to announce next month a new batch of measures as a result of a ``great debate'' launched by Macron so ordinary French people could express their views on key issues.